The kids and the kids-at-heart are all invited to attend Private Iris' hit detective comic book launch of "Case 17: Going Pinoy" - the very first issue in 3D images tomorrow, July 23, 2011 at Powerbooks Greenbelt at 3pm. 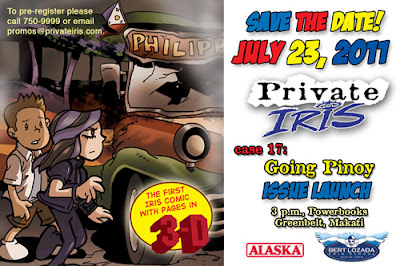 The story is about the kid detective duo IRIS ABLE and DANTON CORD to solve a mystery at their parents' homeland - the Philippines. With more teens and kids going loco over Japanese and Korean anime and comic books, Private Iris' new series should be supported by our very own children and parents. This should motivate more children to pursue their talent in creating stories and wonderful cartoons to inspire fellow Filipinos. Now, why would you miss it?